The firm: Armstrong Teasdale is an Am Law 200 firm with 10 offices across the US. The challenge: Founded in 1901, Armstrong Teasdale is considered one of the pre-eminent firms in the Midwest. Although well-known in this region, the firm is growing rapidly with recent expansion on the East Coast. 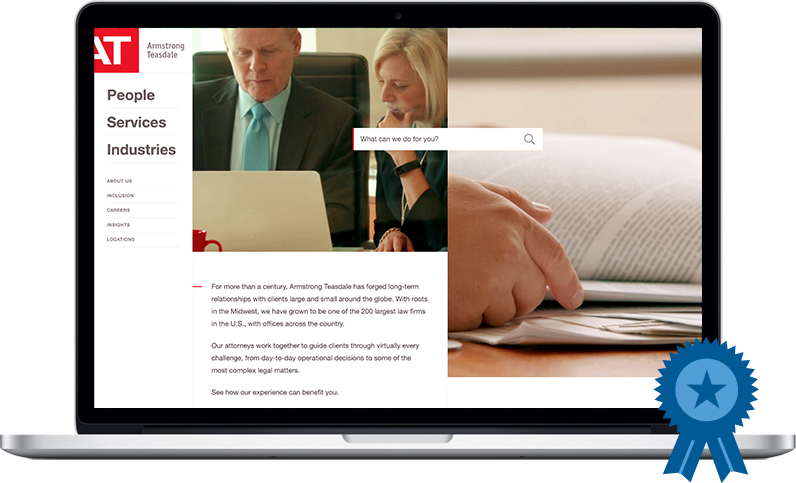 To help demonstrate its geographic reach, the firm needed a website with powerful business development tools and a look that cleanly showcases the depth of their attorneys’ experience. 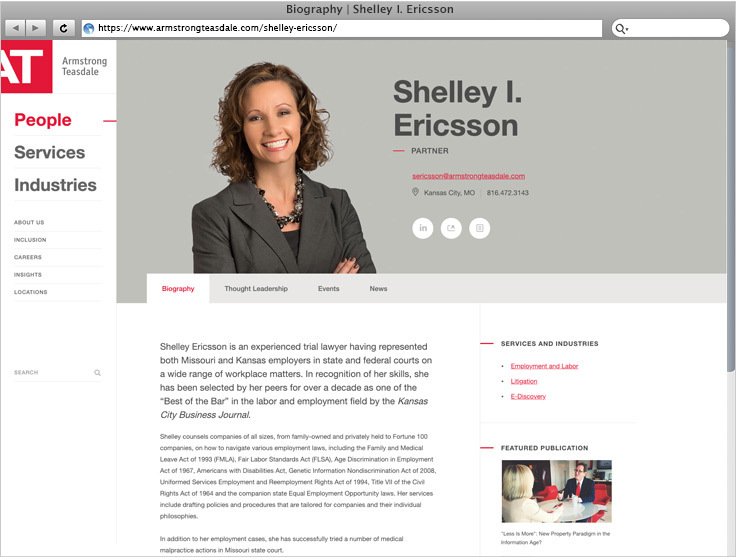 The website’s homepage is anchored by a one-of-a-kind, split-screen videographic showing the firm's attorneys “in action.” Shot in the firm’s St. Louis office, the video creates an emotional connection with website visitors and reflects the professionalism of the firm and its attorneys. Great Jakes produced this video in collaboration with Nutmeg. The website is equipped with Great Jakes’s User Engagement Toolbox. This feature-set allows firms to easily create and manage an unlimited number of sidebar widgets to display content like photos, videos, pull-quotes, calls-to-action, and various types of featured content. These widgets can be deployed in the sidebar area of almost every page of the website and can be easily managed using simple drag-and-drop controls. A standout element of the website’s design is its unorthodox left-side navigation, which remains on-screen at all times. Clicking any item in the navigation opens a fly-out panel with additional navigation options. Aside from adding a distinctive flair to the website, this menu style allows users to navigate the site more quickly and easily than do conventional navigation paradigms. The website is built with “dynamic content teasing,” an award-winning feature that helps keep visitors engaged by suggesting relevant content. 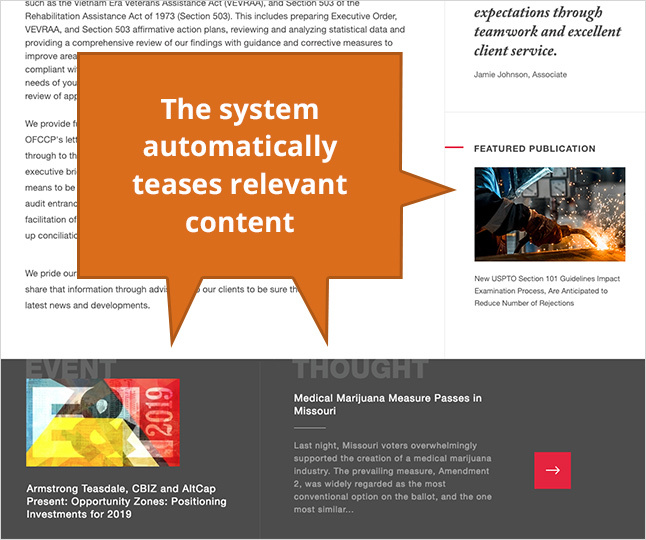 Teasers can be manually curated or set to “automatic mode,” which uses a proprietary algorithm to suggest related content. Content teasers appear within the sidebars as well as in the “Highlights” section located in the footer of every page. The website features Attorney Microsites—a unique approach to lawyer bios that was pioneered by Great Jakes. Attorney microsites are, essentially, small websites for each attorney that fit within the firm’s larger website. Attorney microsites can be customized to the specific business development needs of each attorney and contain any number of pages or type of content. For a great example of how the firm is using the attorney microsite functionality, see Jeffrey Schultz. Our microsite technology was also deployed for the firm’s Services and Industries. For a great example of Services, visit Intellectual Property Litigation, and for a great example of Industries, visit Higher Education.